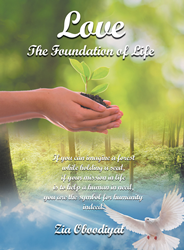 Recent release “Love: The Foundation of Life” from Page Publishing author Zia Oboodiyat is a poetic work illustrating that the ultimate beauty in life is in loving, caring, and sharing oneself with family, friends, community, and mankind as a whole. Zia Oboodiyat has completed his book “Love: The Foundation of Life”: an inspiring collection of poems dedicated to children with special needs and their families. Zia Oboodiyat’s first book, “Treasures Within,” makes an attempt to identify the human attributes (e.g. love, courage, patience, stamina, etc.) as a toolbox available to humans for living a loving life or overcoming any obstacle in life. In his second book, “Is Life a Dream?” Zia introduces the idea that human beings have the ability to imagine, dream, and creatively think. Thus, if they aim a dream and use their ability to creatively think to plot a path to achieve their dream and utilize their treasures within to overcome any obstacle, he concludes that life is not a dream but that they can live the life they dream. In this book, “Love, the Foundation of Life,” he shares his love for humanity and promotes the idea that upon cleansing of self of the pollutions introduced in our heart, mind, and soul, and learning to love self, human beings then will realize the significance of love and loving one another, and build a world where a unified effort toward improvement of quality of life is shared by all human beings. Published by New York City-based Page Publishing, Zia Oboodiyat’s book is a collection of inspirational and poetry with a message of positivity and love for all humanity.